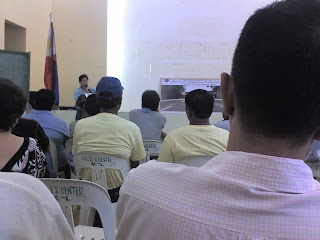 Have attended the meeting called by our town’s mayor Mon Ilagan and DPWH Edgardo Peralta regarding the Rehabilitation of Manila-East Road. Our one-lane road would be widened to 15 km. to add another lane, new drainage and sidewalk. DPWH officials think that it will solve the drainage and traffic problem of the town which I agree but a lot sacrifice for the residents who live along A Bonifacio Ave. The people who live along A. Bonifacio are the original clans and families of Cainta. I was relieved that they didn’t pursue with the original plan of 20 kms because that would be getting much of our lands. I noticed that all families attended and everybody want to express their view on this impending widening on our community.